Semperoper, Dresden, Germany. Saturday, March 31st, 2018. ‘Mors certa, hora incerta’. So declares a text at the front of the stage in Dietrich W Hilsdorf’s staging of Lucia di Lammermoor in Dresden. Premiered in November 2017, I saw the eighth performance of a run that has spanned the season of this beautiful house on the banks of the Elbe. Hilsdorf seems very much aware that this is a piece that culminates in the heroine’s insanity and eventual death. We may get bel canto thrills along the way but this is ultimately a somewhat gruesome tale. And in Hilsdorf’s hands it was certainly gruesome. Hilsdorf is a name new to me although he is one of Germany’s more active stage directors since his operatic debut in Gelsenkirchen back in 1981. This was his Dresden debut. His staging is built on simple visuals. An open set, chairs arranged around the back, a long dining table along the side and rows of fluorescent strip lights along the back of the stage. 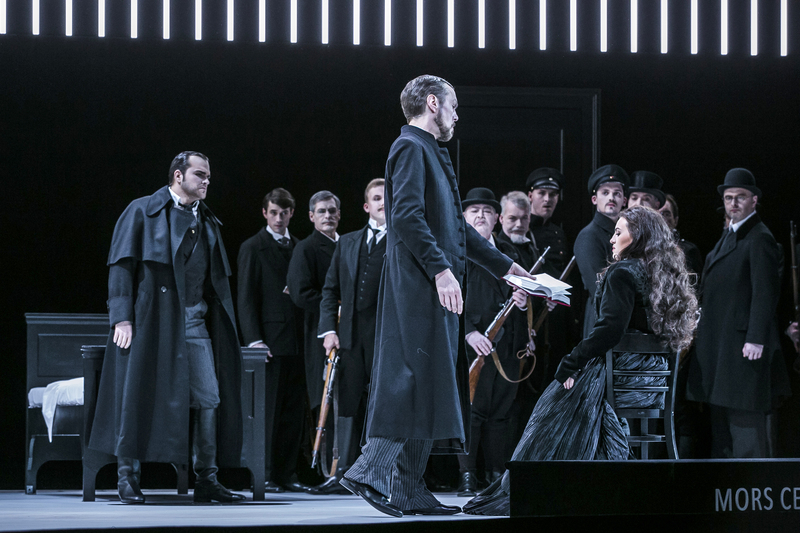 The almost exclusively black stage furniture and black costumes give the visuals an elegance and clean simplicity that I found had the potential to work well, in that it gave the opportunity for the singers to guide the action. And yet it felt that characters were under-directed, usually staring into the middle distance, barely engaging with each other and the chorus was marched on, parked and then marched off again. Although I must say the man vomiting at the side of the stage after the mad scene did offer some visual interest. The constant presence of a bed at the centre of the stage held some symbolic value and provided the opportunity of a big reveal of Arturo’s body during the mad scene. The rows of lights at the back were migraine-inducing in their brightness and surely a warning should have been given to epileptics due to the way that they flashed as if replicating lightning in the Wolf’s Crag scene. 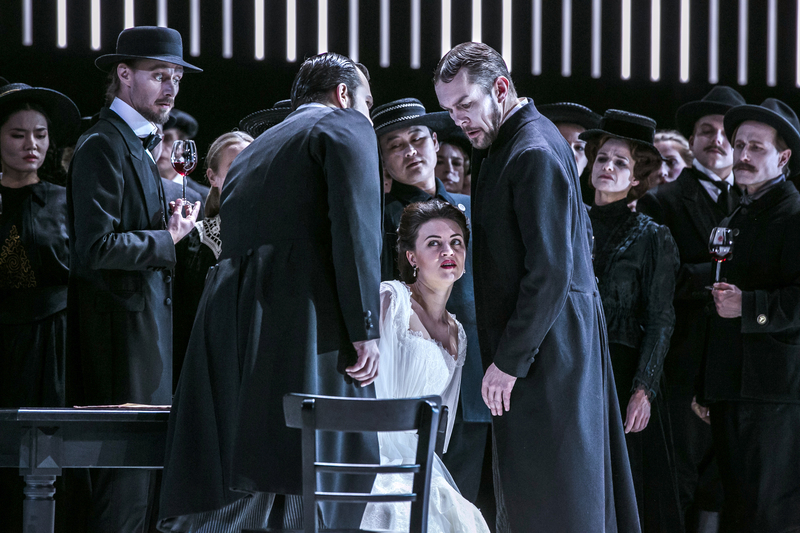 The appearance of a ghostly figure as Lucia sang ‘regnava del silenzio’, brought back some traumatic memories of Katie Mitchell’s London Royal Opera staging – although the ghost was seen once and never returned thereafter. This was a society where nobody had privacy and it was impossible to be left alone. Certainly, at least until the final scene, where Edgardo is alone on stage, the chorus singing from the pit. It made for a strong finish and undoubtedly the strength of Hilsdorf’s approach is in the clarity of the visuals – even if what happens within those seems underdeveloped. Fortunately, musically this was a solid performance. Venera Gimadieva was a fine Lucia. The voice is a good size, the line even and she made a decent stab at a trill. The tone is somewhat shallow and can turn slightly acidic at the very top. However, up there it sounds most impressive, carrying over the ensemble with ease and thrilling the audience with abundant acuti. Her mad scene had a sense of improvisatory freedom, the voice complimenting the dismembered ghostly pallor of the glass harmonica (fluently played by Philipp Marguerre). As of yet, it struck me that Gimadieva doesn’t quite have the ability to exploit the full range of vocal colour available in the voice, and her performance felt lacking somewhat in expression. The willingness to mould the lines, to truly live them from within, wasn’t quite there – although hopefully it will come soon. Still, the security of her vocalism was extremely impressive and the sheer ease and freedom on top absolutely staggering. Edgaras Montvidas gave us a warm and generously sung Edgardo, the warm, ardent and oaky tone giving much pleasure. As so often with the role, he truly came into his own in the final scene. His ‘fra poco a me ricovero’ sung with wonderfully long lines, masculine Italianate tone and an open top. In his closing aria, like many before him, he was slightly taxed by the rising repetitions of ‘bell’alma innamorata’, but the lovely honeyed shading that he found for ‘tu che Dio spiegasti l’ali’ was absolutely ravishing. A notable assumption. Aleksei Isaev was an impressive Enrico. The voice itself has a covered quality in the middle but it rises up to a seemingly limitless, penetrating top with steel among the velvet. Most impressive. 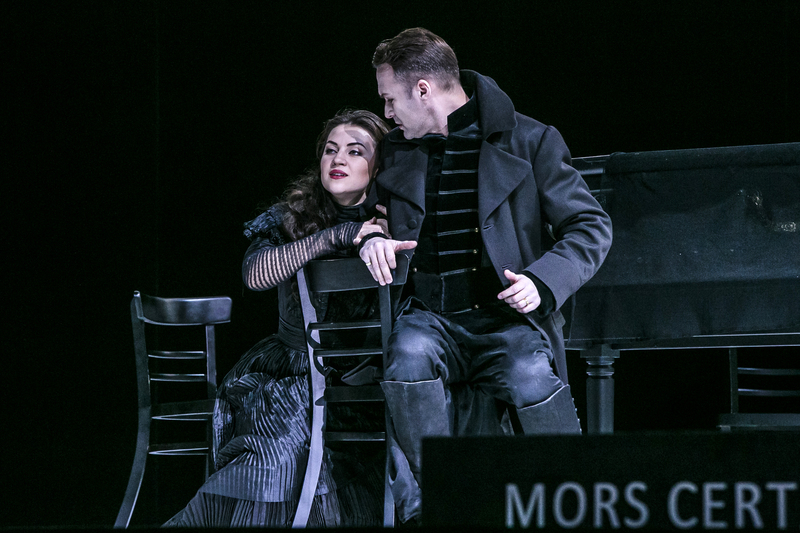 Georg Zeppenfeld was luxury casting as Raimondo singing with a very classy sense of line, the voice absolutely even from top to bottom with fantastic resonance down there with a tone of highly attractive complexity. The tasteful embellishments that he brought to the line were also most welcome. The remainder of the cast reflected the exceptionally high standards of the house. This isn’t the most choral of operas but the house chorus as always gave us singing of warmth, excellent blend and impeccable ensemble. This is a chorus that is worth travelling a very long way to see. The Staatskapelle also played extremely well for Giampaolo Bisanti. The string section was relatively small which allowed the winds to take a more prominent role in the texture, playing with genuine personality. The acoustic of the Semperoper is incredibly warm and resonant and I felt that the orchestra ideally needed sharper attack in the strings in order to give the orchestral texture slightly more dynamism. The sound itself was glorious, however. Bisanti’s conducting I found curious. Tempi were quite leisurely on the whole although he took Edgardo’s closing aria slightly more swiftly than one usually hears it. His tempi did feel wayward even slowing down and accelerating within the same passage. 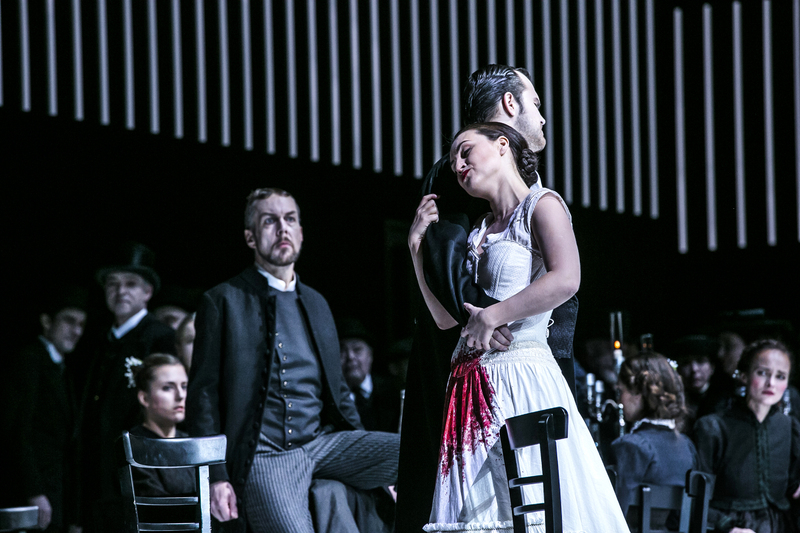 For instance, the Lucia/Enrico duet starting at ‘se tradirmi, tu potrai’ started off at vivace and then dropped to half speed as Lucia entered, where it remained for the rest of the number. The audience, however, seemed to appreciate Bisanti’s conducting, giving the maestro a warm ovation at his curtain call. This was something of a mixed evening. 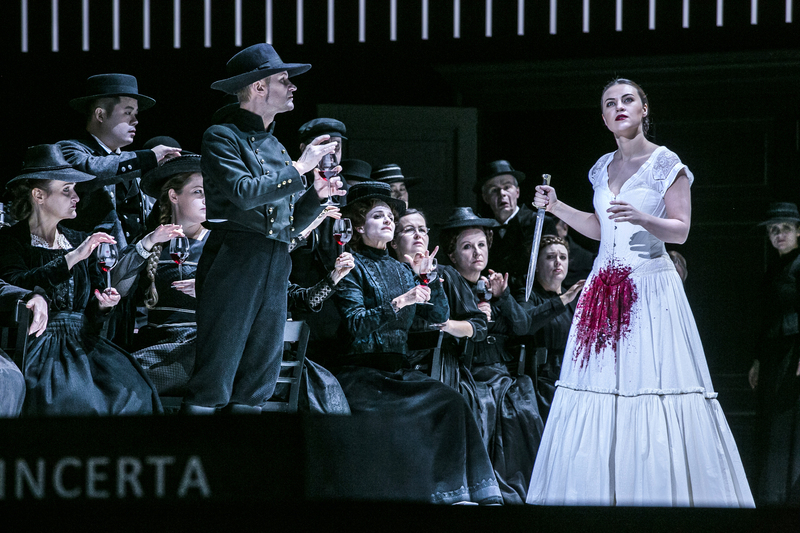 The staging certainly had much to offer in terms of visuals, yet felt lacking in personenregie with much static placement of characters on stage combined with stock operatic gestures. At the same time, we received some highly impressive performances throughout the cast. It was certainly satisfyingly sung throughout and well played by the house forces. Above all, this was a showcase for the human voice and highlighted both some very promising as well as impressively established talent. It was definitely worth making the journey to see.